On a summer day more than a decade ago, climber Craig DeMartino was working his way across a tricky route (rated 5.11c) in Rocky Mountain National Park, when he had a momentary miscue with his climbing partner. In that moment, DeMartino's life unfurled, and he fell 100 feet to the hard ground below. His injuries were extensive: broken neck, punctured lung, broken legs and hip. Over the next few years, DeMartino, a handsome All-American-looking guy, underwent surgeries and rehab and more surgeries, including opting to have his non-functional right leg amputated. Miraculously—or perhaps boldly—he returned to climbing, and last year he tackled El Capitan, one of America's most daunting cliffs, along with fellow missing-limb athletes Jarem Frye and Pete Davis. 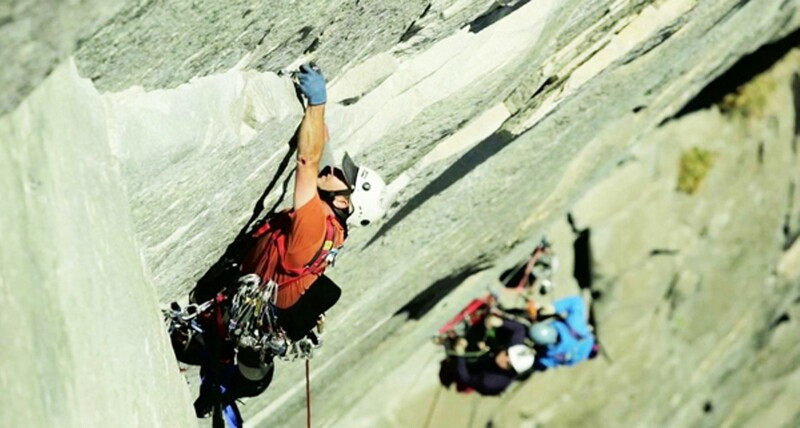 These three men are the charismatic subjects of the touching, humorous and inspiring film Gimp Monkeys, a short movie about the trio's successful ascent—the first known all-disabled ascent—of Zodiac, a 1,800-foot route on Yosemite's iconic El Cap. On Oct. 3, Gimp Monkeys (a production of the coyly name Duct Tape Then Beer) will be screening at The Old Stone, along with eight other outdoor movie shorts as part of the Wild & Scenic Film Festival presented by the Oregon Natural Desert Association. Last June, local freelancer Tim Neville was in Yosemite Valley. He arrived after dark and happened to share a campsite with DeMartino and his comrades. When he awoke the next morning, Neville was somewhat confused by the sight of his newly found camping companions. "I looked over and the guy sitting at the picnic table didn't have a leg," Neville explains—an odd site for a climber's campground. Neville recalls looking around and spotting another one-legged guy. Then, still ensconced in his puffy sleeping bag, he watched a guy who was missing an arm pass the Cheerios to his buddy. After rubbing the sleep out of his eyes, Neville, who was there on assignment covering free soloist and speed climber Alex Honnold, realized there was also a film crew mulling about. It all started to makes sense—kind of. There was still the matter of how these three disabled men planned to scale a 16-pitch granite wall that often takes strong climbers four days to complete. What Neville remembers most is that these guys were determined. "These are people that have been dealt a super crappy hand but have managed to turn it around to something positive," says Neville. Neville also remembers some powerful words DeMartino shared about his injury. The climber said if he could go back in time, he wasn't sure if he would change his injury. The missing leg had become a gift. I called DeMartino to confirm that this was still his assessment. When I caught up with him, he was on a climbing and speaking tour in Mexico. He outlined his plan for the coming weeks and months: a 24-hour climbing competition on the sandstone cliffs of Jasper, Ark. ; a climbing trip to Kentucky's fabled Red River Gorge; a return to Yosemite for another big-wall ascent. He was, it seemed, living the life despite his devastating accident a decade ago. "For me, I wouldn't change it now," DeMartino says. "What I've learned and what I've seen has been such an amazing gift. I've grown as a person. I'm so much more empathetic toward others. I'm a better dad, a better husband—I know what it's like to completely depend on someone else." The Old Stone, 157 NW Franklin Ave.
Mt. Bachelor's new downhill mountain bike park. Yeah, we've said it before, but the cooler temps and light moisture have done magical things to the dirt on those lift-accessed trails. Go soon, because they're closing after Columbus Day (Oct. 14). The park is open Fridays, Saturdays, and Sundays from 10 am to 4 pm. Lift tickets are $29 for a full day or $19 for a half day (1-4 pm). Not into riding downhill? Hitch a ride up the hill with your gravity-minded partner and, while he/she rides Mt. Bachelor you can tackle the nearby cross-country trails. Try riding from Tumalo Mountain (via Flagline Access Trail) all the way back to town. It's fun! Or, simply go for a hike or a run up Tumalo Mountain. The hiking trail heads directly uphill from the Dutchman Sno-Park parking lot and gains approximately 2,000 feet in two miles. Steep, but 360-degree views await.